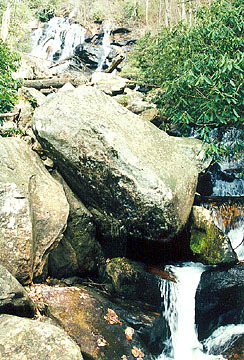 Corbin Creek Falls (aka Laurel Falls) is downstream of Whitewater Falls and can be quite impressive after a heavy rain. 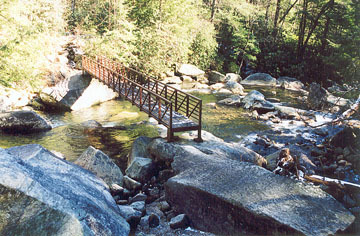 The Foothills Trail crosses at the base of the falls just yards from where Corbin Creek flows into the Whitewater River. Decent winter views can be had from the paved path to the Whitewater Falls overlooks by looking right across the Whitewater River gorge. From the Whitewater River overlook, take the spur trail down to the white-blazed Foothills Trail and follow it down to the river for about .5 mile. Mind the slick wooden steps. Cross the Whitewater River on a metal bridge and follow the Foothills Trail a few more minutes to the wooden bridge over Corbin Creek. 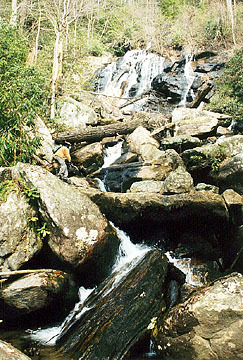 Look upstream to see the falls. Directions: From Sapphire, follow NC 281 south for nine miles to the Whitewater Falls parking area. 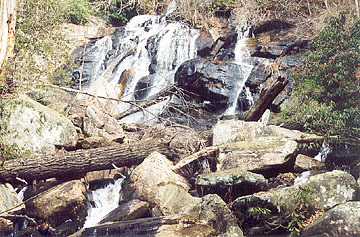 From Cashiers, go south on NC 107 for nine miles, turn left onto SC 130 and follow the signs to Whitewater Falls. From Walhalla, take SC 28 to where it intersects with SC 107. Take SC 107 north for about 11 miles and look for signs directing you to Whitewater Falls. Turn right onto Wiggington Road and follow for two miles, then turn left onto SC 130 and follow for another two miles to the Whitewater Falls parking area. Be aware, SC 130 will become NC 281 just before the parking area.